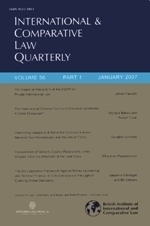 The third issue of International and Comparative Law Quarterly for 2013 includes one short article by Cameron Sim on Choice of Law and Anti-Suit Injunctions: Relocating Comity. English private international law generally gives a potential role, where appropriate, to foreign law, by allowing for the application of choice of law rules to determine its relevance. Yet in the context of anti-suit injunctions granted otherwise than in aid of a contractual right not to be sued, choice of law is conspicuously absent. In those cases, courts simply apply the lex fori without paying any regard to foreign law, although the notion of comity is taken into account in the final decision on whether to grant anti-suit relief. Clearer identification of the grounds for granting such relief should limit application of the lex fori to instances where the anti-suit injunction serves as a form of ancillary relief to protect the judicial processes of the forum, and in which comity plays no role. In all other cases, which ultimately concern private justice between the parties, comity is best understood as an expression of justice in cases involving foreign elements, and better reflected through choice of law rules, which might lead to the application of foreign law. This approach is preferable to invoking comity as a consideration relating to the manner in which the court regulates the grant of anti-suit relief, because courts tend to bestow rights, which parties may not otherwise have, under the cloak of comity. Understanding comity as the catalyst for taking account of foreign law assuages concerns about interfering with foreign courts, acts as a deterrent to remedy shopping, and provides greater certainty as regards the vindication of rights. The case for widening the application of choice of law in this context does not depend on Rome II, but if the principle is accepted, courts must follow the process which it specifies.